Farm to table indeed. 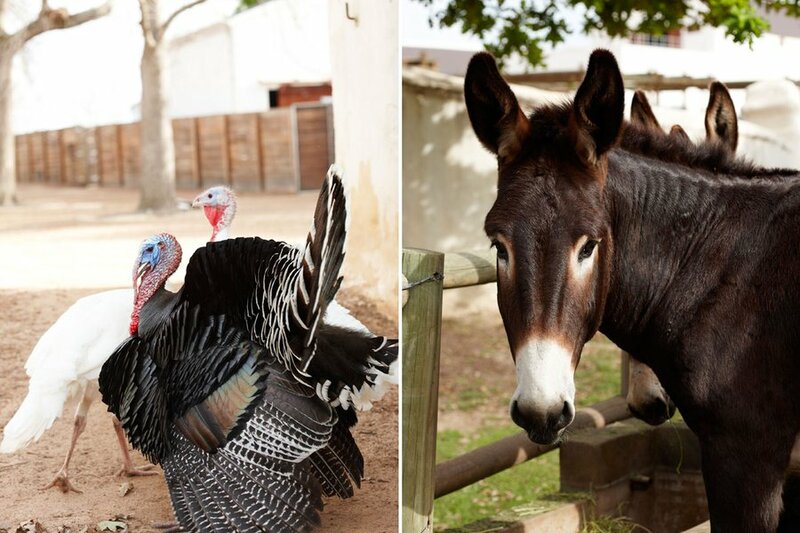 Photo: courtesy of Babylonstoren. Fresh flowers, grapes, olives, and plum blossoms. Cherry tomatoes paired with fresh watermelon. Cantaloupes and peaches accompanying pumpkin slices and millet. 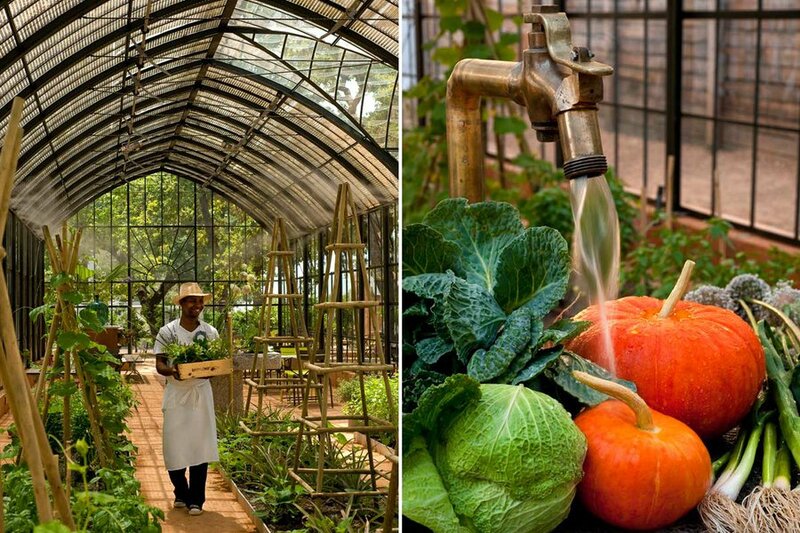 Paula de la Cruz takes in the colorful bounty at Babylonstoren. FRANSCHOEKK, South Africa – Big yellow squash flowers as bright as suns were the first thing that caught my eye as I entered the stainless steel and white tiled kitchen. The flowers were not decorating plates of risotto or bubbling in a frying pan, but were arranged on a shiny, dark chocolate-glazed cake, still crisp with morning dew. 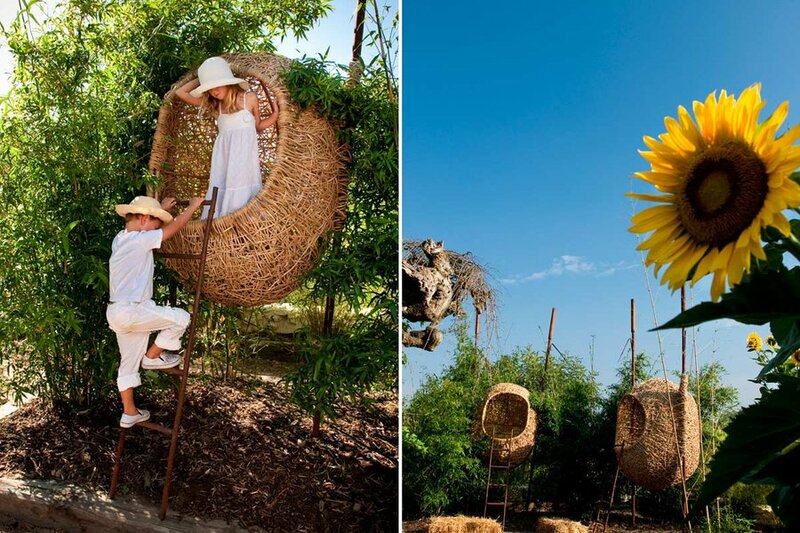 Experimenting with flowers and all that a garden produces is the very soul of Babel, the restaurant at Babylonstoren, a 17th-century Cape Dutch farm an hour east of Cape Town in South Africa’s Franschhoek Valley. I had come to the region best known for its bold wines and French colonial morsels, to eat, drink, and garden, in that order of importance and intensity. 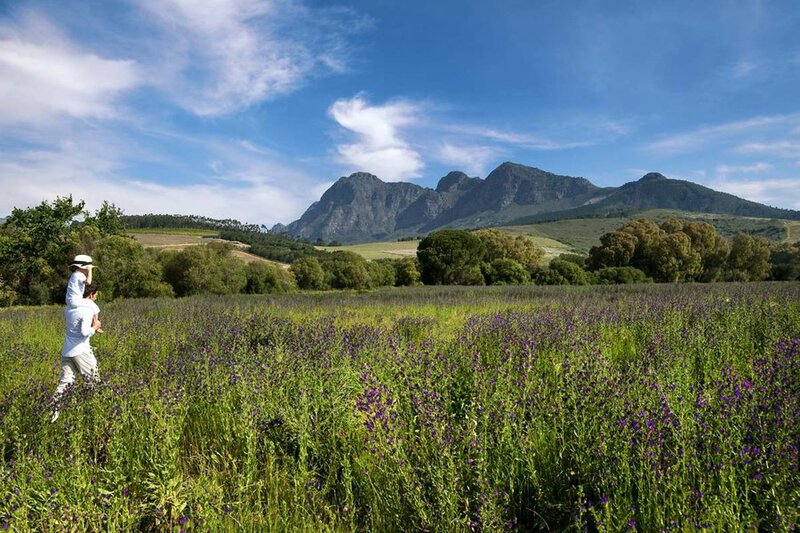 Sheltered by the grey and imposing Drakenstein Mountains, the rolling hills of the Franschhoek and Stellenbosch wine valleys are covered in varying shades of purple and green grapes, olives, and plum blossoms from September through March. Along the winding roads, old farmsteads in the flat valleys stand white against their dark stone, contemporary counterparts perched on hillsides. 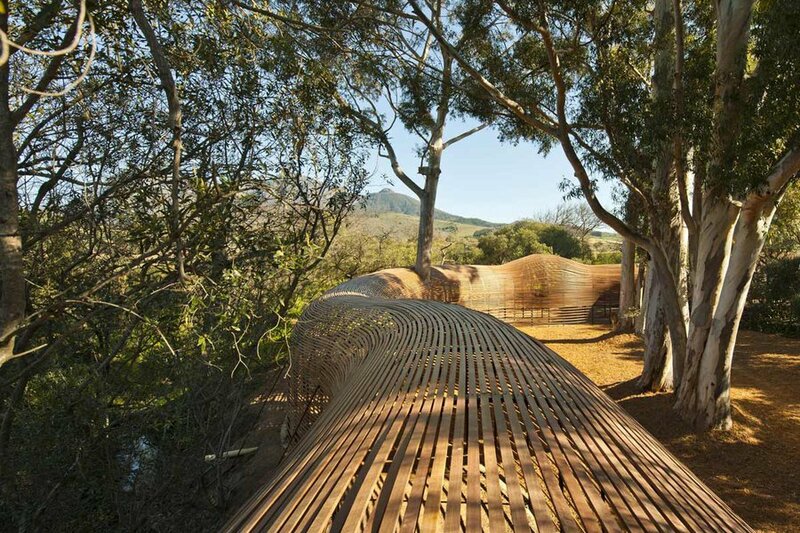 A quiet solitude, interrupted only by the rhythmic tunes of a mild breeze, defines the spirit of Babylonstoren. The occasional bleating of a goat reminds me of the local chèvre that farmers have been refining here, along with cabernet franc, pinotage, and chenin blanc for centuries. 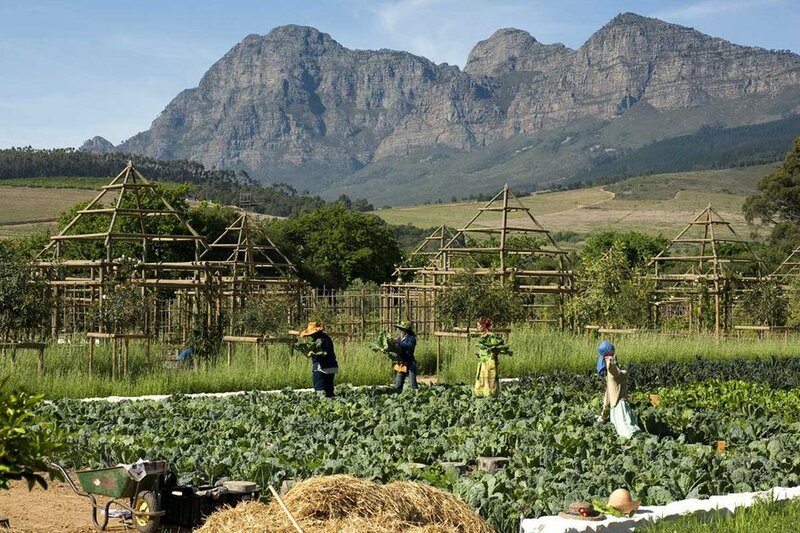 The first settlers arrived to the Cape Peninsula in 1652, sent by the Dutch East India Company with the sole purpose of establishing orchards to provide fresh produce for ships traveling from Europe to Asia and back. In 1688, 178 Huguenot families — French Protestants heavily persecuted in the 16th and 17th centuries — found refuge in the new Dutch colony, bringing winemaking traditions with them. They transformed elephant grazing grounds into winelands and farms and renamed the area coin français (French corner). In Afrikaaner, Franschhoek. 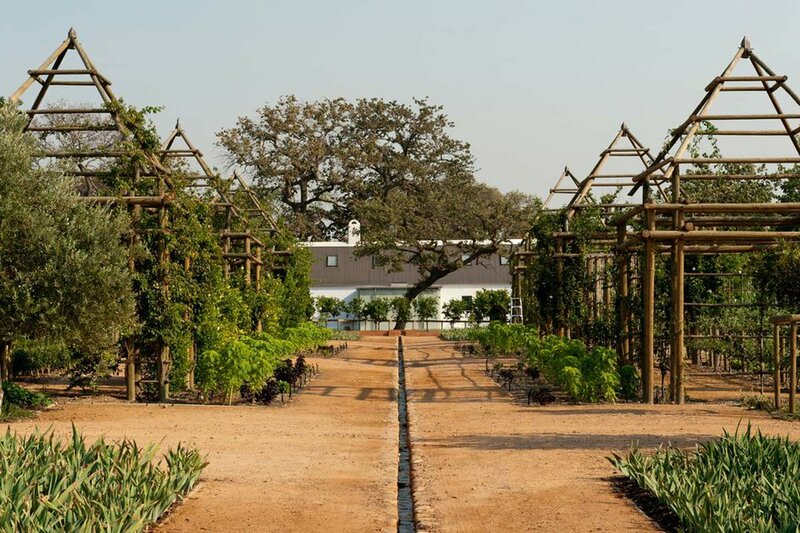 A Dutch knack for horticulture, coupled with a fascination with all things new, led Simon van der Stel, the first governor of the Cape Colony, to develop the winelands south of Franschhoek. 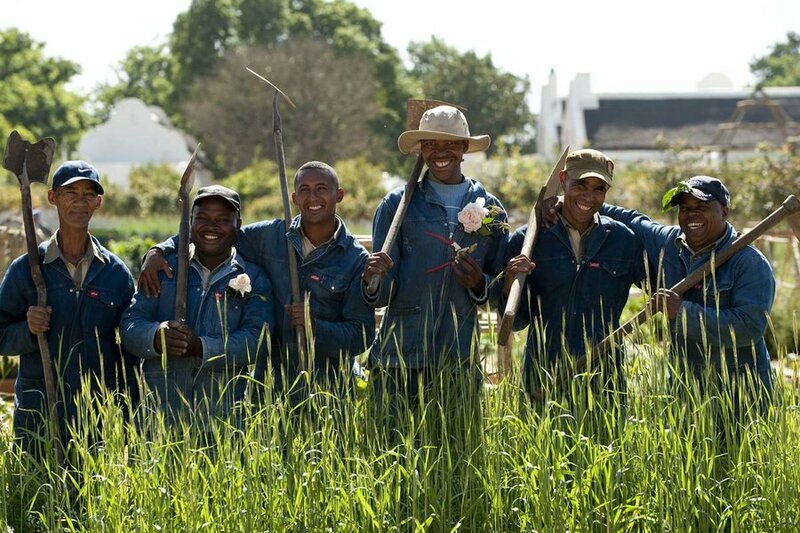 He beautified the farmsteads of the valley, planting enough oak trees for the area eventually to become known as Stellenbosch — literally, Stel’s forest. 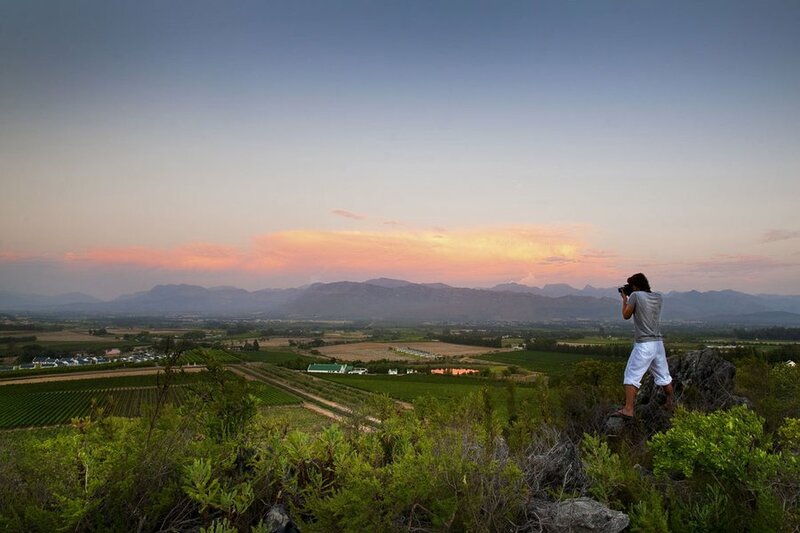 Today, Stellenbosch and Franschhoek together export more than 400 million liters of wine a year, attracting gourmands and oenophiles from around the world. The governor would be proud. That evening, contemplating the squash flowers on the cake, I wondered if a sparkling wine made from chenin grapes would best emphasize the cocoa and subdue the earthiness of the flowers. The meal had begun with a cooking session in the restaurant’s kitchen, where I, along with my nine dinner companions, prepared dinner under the tutelage of Babel’s young chef, Simone Rossouw. 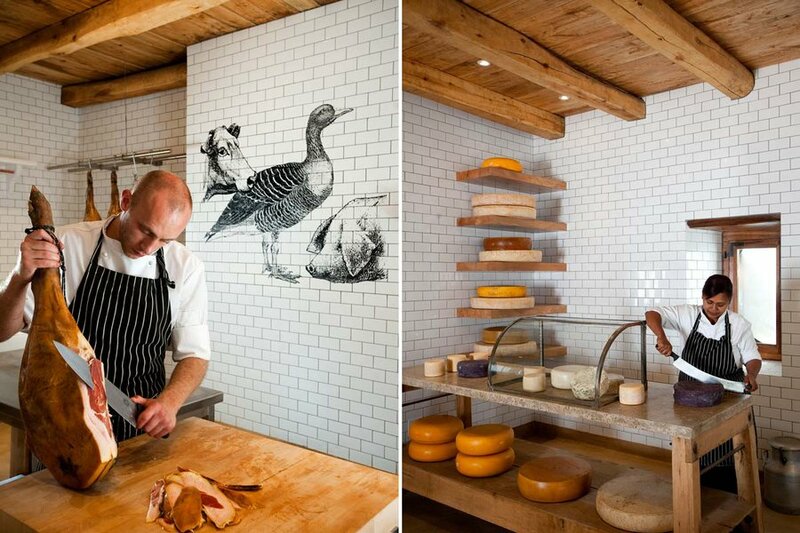 Babel’s open kitchen overlooks the whitewashed dining room, a mural of a huge cow’s head watching wearily from the back. We roasted eggplants with melted local ricotta and blue cheese, topped them with the last figs of the season, then garnished them with pesto and pear slices with a cashew-nut dressing. This was our main course, but hardly the meal’s sole star. The Babel salad. An oval plate that looks like a contemporary version of a Dutch master’s still life, heaping with vegetables and served according to color categories. Cherry tomatoes are paired with fresh watermelon; cantaloupes and peaches accompany pumpkin slices and millet. Everything had been picked that morning from the farm’s organic garden. 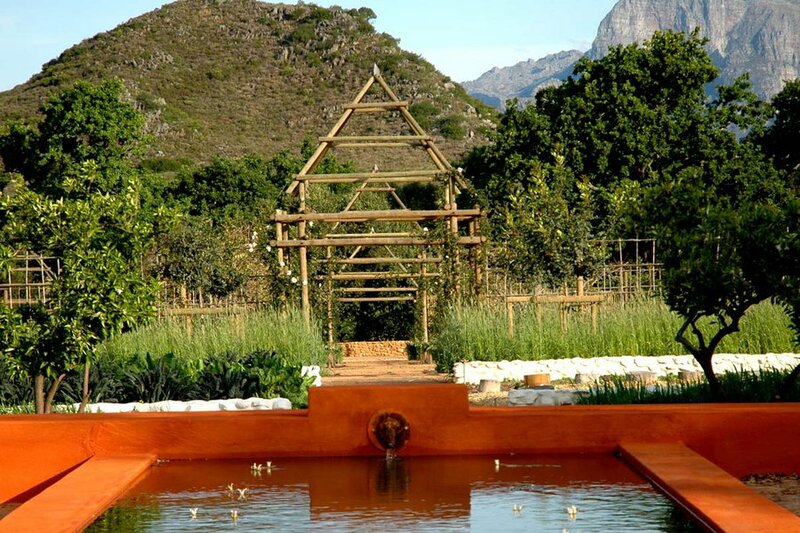 Babylonstoren's eight-and-a-half acre edible garden, the lifeblood of the farm, was designed after the Company’s Gardens, the original Dutch East India Company orchard in Cape Town that fed sailors and saved them from scurvy. I had walked along its main axis that afternoon picking red peppers, smelling French roses, and stepping barefoot in fields of plushy thyme before returning to my cottage. 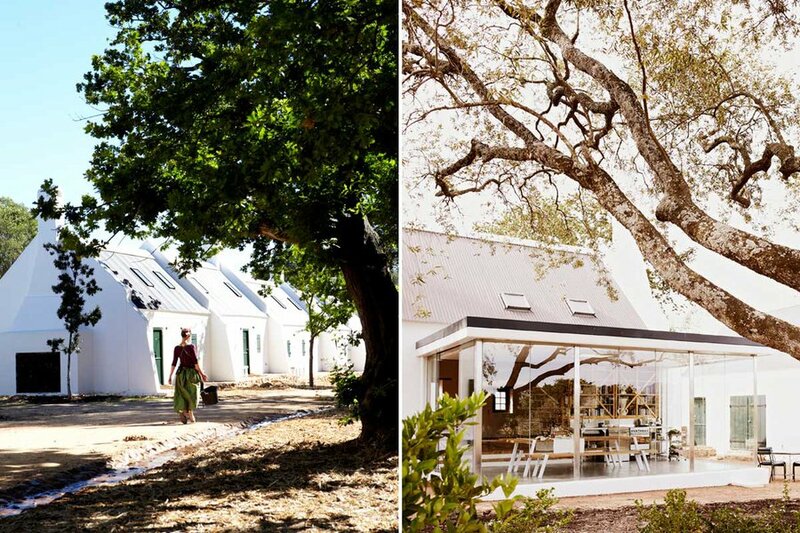 Karen Roos, the former editor-in-chief of Elle Décor South Africa and Babylonstoren’s owner and creative force, hadn’t hesitated to include a little humor in her impeccable restoration of the buildings. Straw lions peek out from cabinets in the library; huge rubber ducks entertain guests bathing alone or with others. 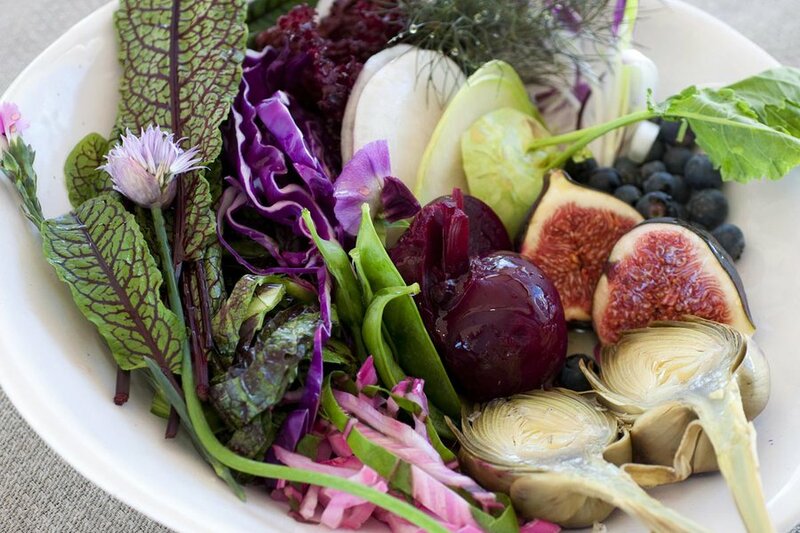 Any proud omnivore knows that the organic salad you’ve harvested by yourself is only half the plate. 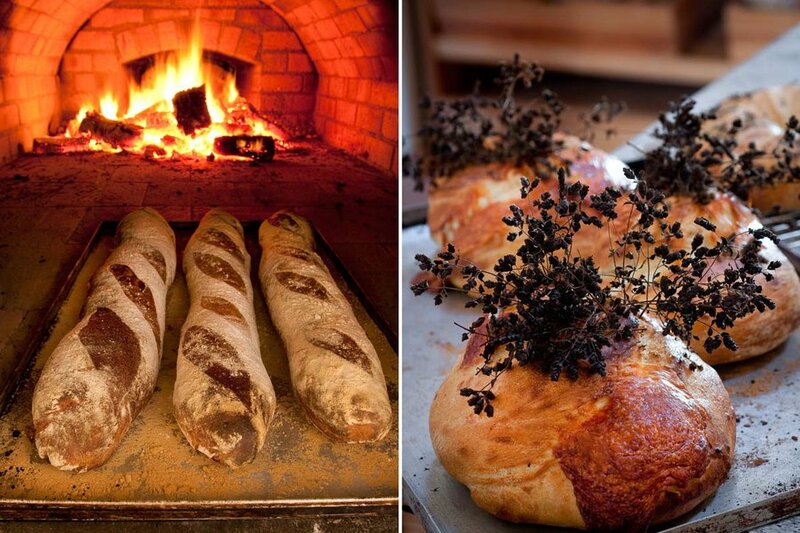 On one of my excursions through Franschhoek, I stopped by Bread & Wine, the restaurant at the Môreson Estate, where the colorful and mildly foul-mouthed chef produces the best charcuterie in the valley. Neil Jewell’s fascination with cured meats began during a trip to northern Italy, where he learned that the earthy taste of the local ham came from pigs munching their way through chestnut and oak forests. When I met him, chef Neil’s most prized possession was a cured leg of lamb. He proceeded to explain that his lambs — and all of his animals, for that matter — didn’t know the savagery of mechanized food production. They enjoy a standard of living leaps above “natural grazing” cattle; they are massaged, fed dried fruits, and allowed to spend time with their offspring. The result is the exquisite cured leg of lamb that took six months to perfect and is stored in a walk-in refrigerator — “the vault,” as Neil calls it. As he handed me a paper-thin slice, he told me, “Rub the fat back and forth. See how smooth it is? See that the fat doesn’t break down? That’s the sign of a great cured meat.” It did feel so smooth and paraffin-like that I wanted to rub it on my face, just in case it was the undiscovered fountain of youth. But I didn’t. It looked too delicious, and I feared offending the chef and the memory of this lamb. The pre-lunch charcuterie lesson ended just in time for a drive through the winding Helshoogte Pass, which connects Franschhoek and Stellenbosch. 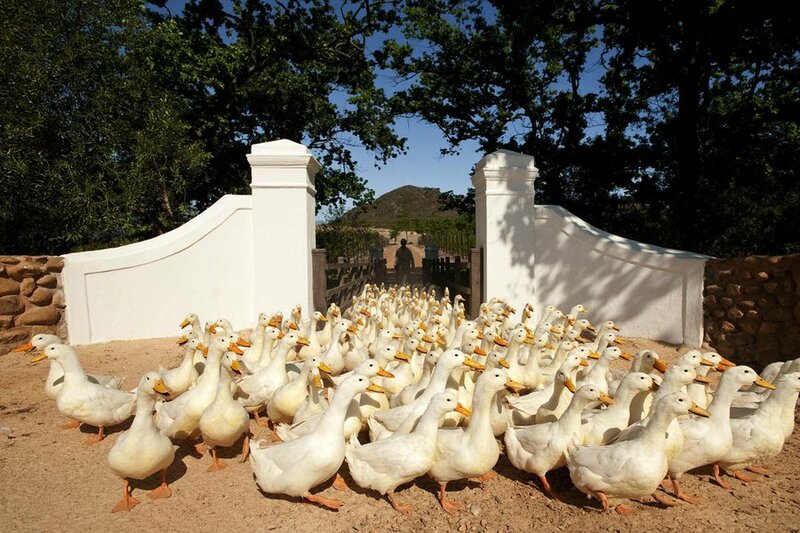 On the crest of the pass sits Delaire Estate, the hotel and restaurant owned by the diamond company Graff that commands the most magnificent views of the winelands and surrounding hills. 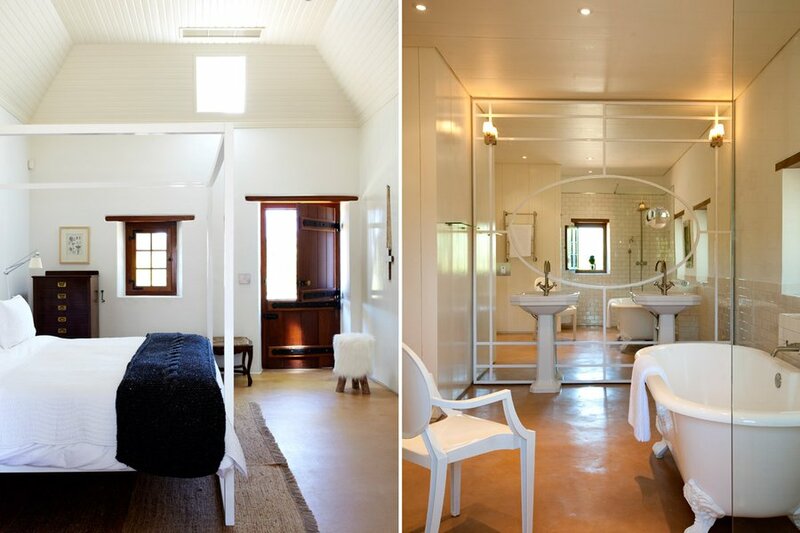 From shimmering arrowroot wall coverings to displays of rings and earrings the size of nosegays, the décor was a real contrast to the simplicity of Môreson’s Bread & Wine and the earthiness of Babylonstoren. The cuisine was also more elaborate, if less inventive, than the other two, mixing locally sourced produce and seafood. 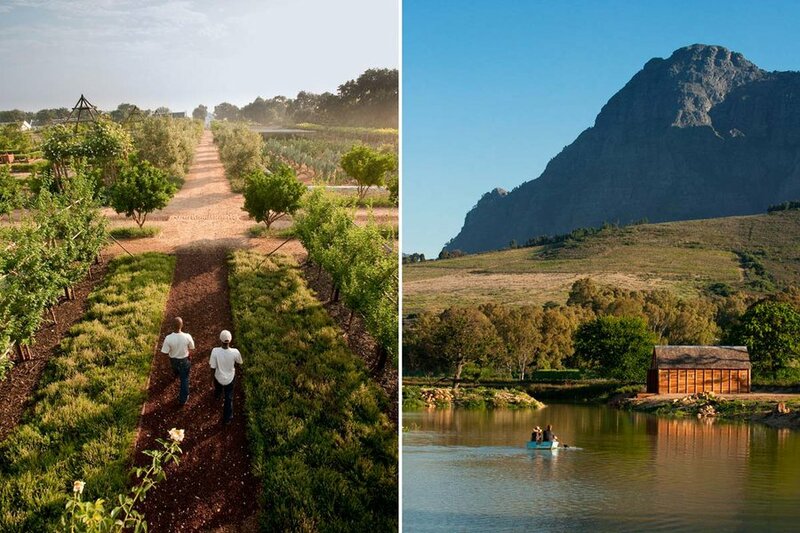 Nothing here recalls the restrained nature of Dutch colonialists, but Delaire Estate is a sparkling temple to the impressive surrounding geography and what lies underneath. 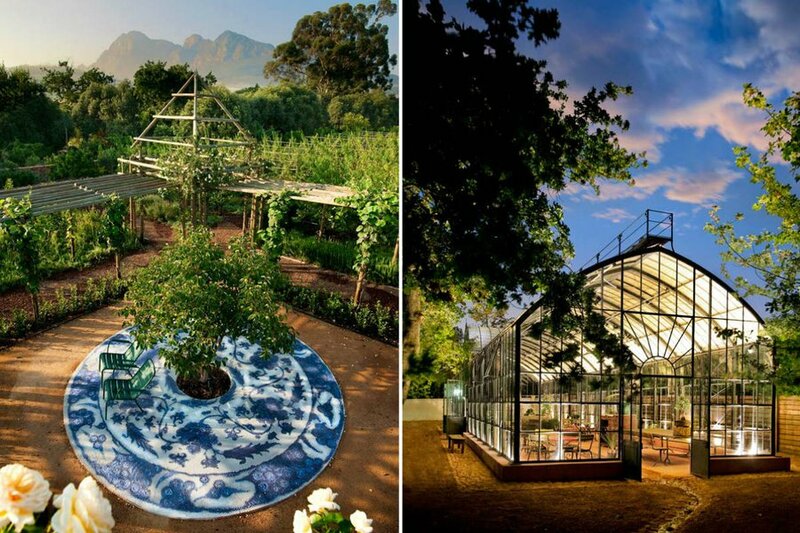 On my last day at Babylonstoren, Liesl van der Walt, the garden’s manager, asked me if I wanted to help plant a macadamia tree. 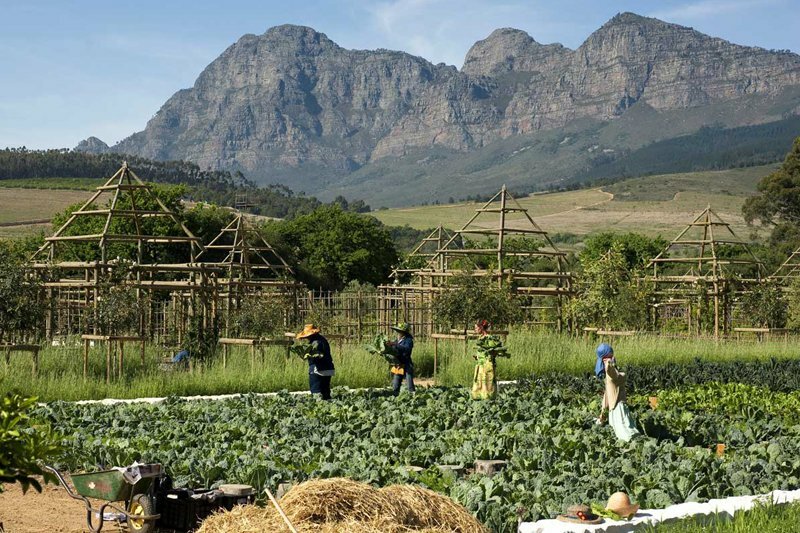 She is still testing which fruit and vegetable varieties work best in the valley and hopes that Babylonstoren will become a resource for growers in the area. After the young tree was planted and watered, we took a walk through the garden. Liesl stopped to point out different types of plums, then showed me the Australorp black hens that had just moved into roomy coops near the farm’s stream. Liesl and chef Simone hoped they would live up to the breed’s reputation and lay copious amounts of eggs and contribute to the compost. “I am constantly learning new things about crops and food production,” Liesl said, "but right now my main priority is that the chickens are happy.” How can’t they be? They live in a land that is beautiful and yields wonders. How to Get There: Most major airlines fly directly to Cape Town International Airport (CPT). 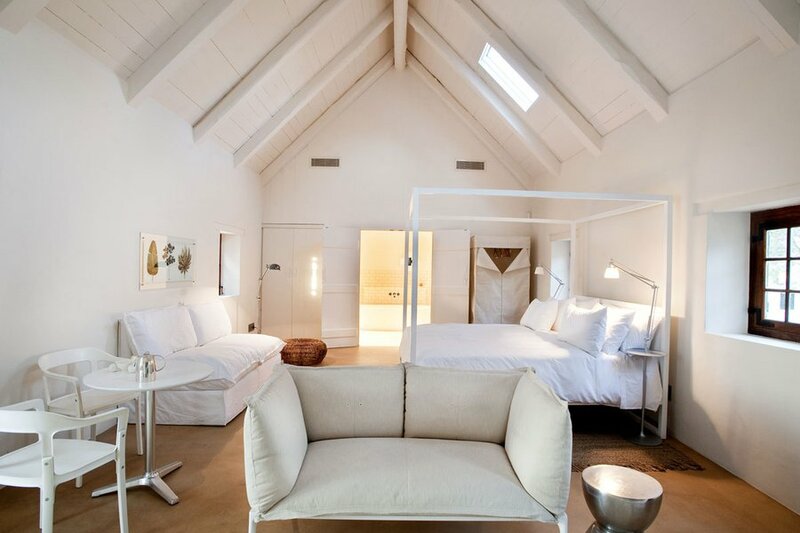 Recently renovated, and with a boat that takes guests for sunset dinners and cocktails along the Cape, I wouldn’t stay in any other place. Try one of the hundred single malts at the Bascule Bar, or the vegan menu sublimely executed by Chef Malika van Reenen at the Cape Grace’s Signal Restaurant. Easily the most vibrant and distinct of all converted farms in the valley. The cottages, with über-modern kitchens where guests can prepare their own meals, makes the hotel a perfect family destination. Don’t miss a canoe ride in the estate’s lake or a bike ride through the nearby hills. If you want pampering, serious wine tasting, or a few rounds golf, there is no better place than this magnificently located resort. The concierge will arrange hot air balloon or horseback rides, depending on how adventurous you feel. 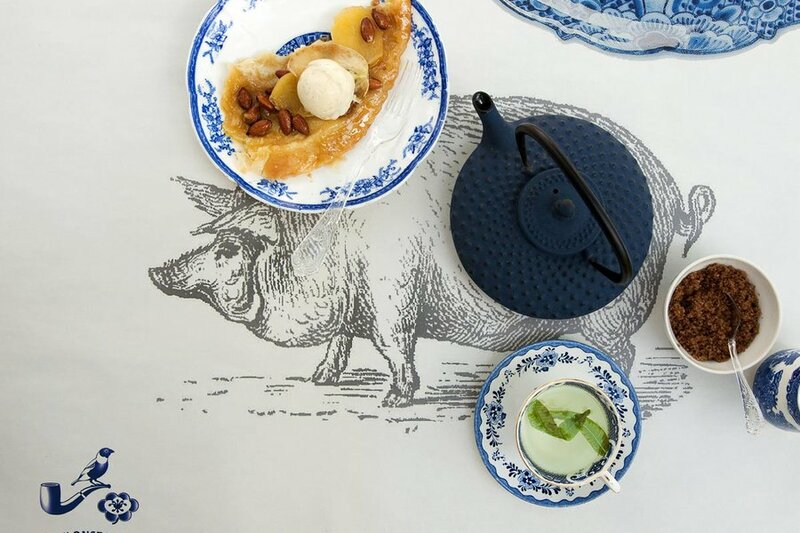 Local foodies travel from near and far for tapas at the Common Room of this Relais & Chateaux. The hotel has a private screening room that can be reserved for cocktails and a pre-dinner movie, or for theme parties. 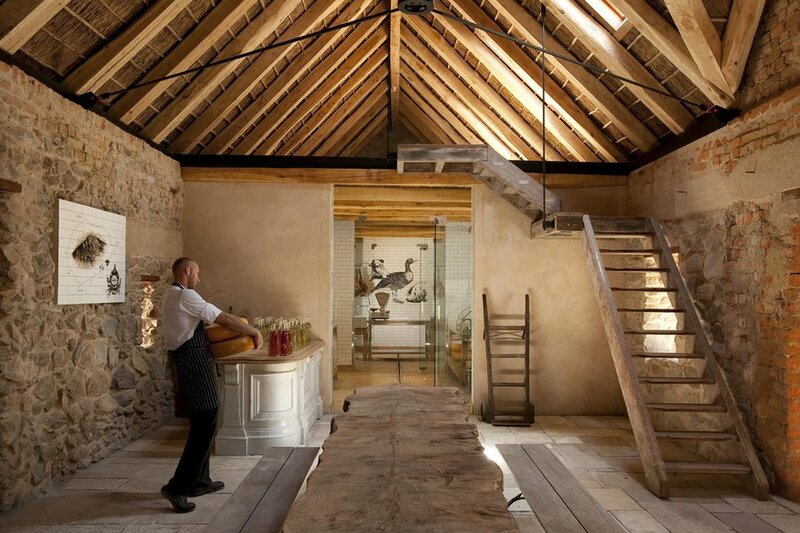 Some of the best game to eat is prepared at this winery’s restaurant, overlooking olive groves on a hillside. 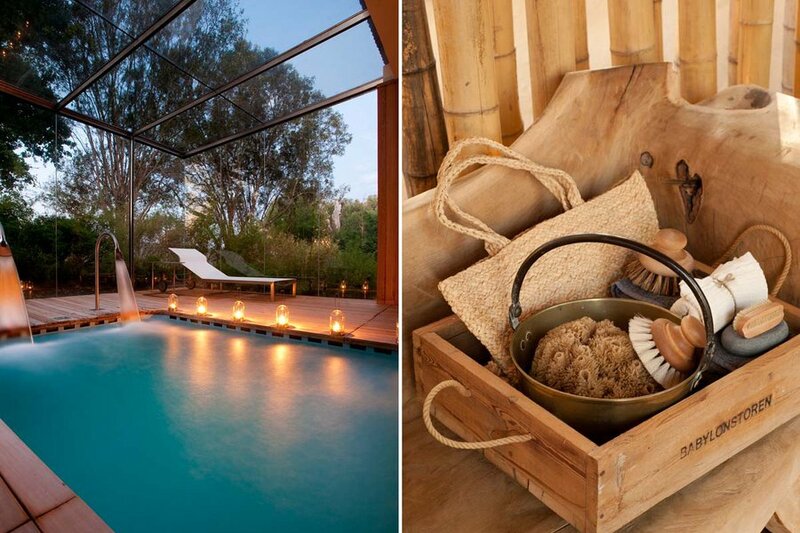 The estate organizes daily olive oil tastings and schedules private ones upon request. The chef at the Kleine Zalze lodge's restaurant is particularly talented at pairing his dishes with the wines produced by the Zalze estate. 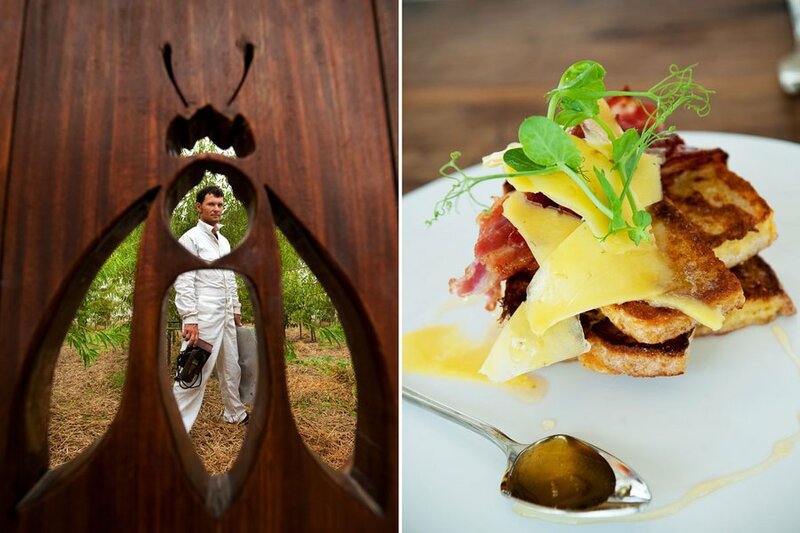 His award-winning food has depth and subtlety, and represents the best of traditional Franschhoek cuisine.